DIMENSIONS(L*H*W): 15.5*7.5*8inch. The fishing tackle bag is multifunctional, and send with a adjustable, detachable strap, can be used as waist bag, shoulder bag and handbags. STRONG QUALITY: The difference between the original version and the Bigger one is not just the size, we also changed the design of the top and back. More humanized. 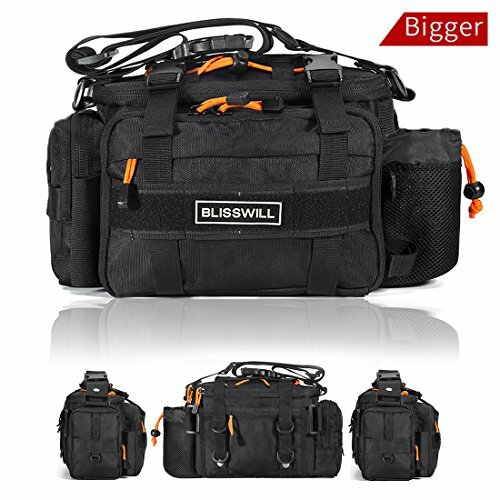 The fishing tackle bag is made of high quality 2000D Water-Resistant Nylon Fabrics. With extra firm stitched, high quality ABS buckle and YKK zipper( The originator of the zipper industry), more durable in different conditions. HUMANIZED DESIGN: Lengthened and widened shoulder pads designed to relieve shoulder fatigue. Come with both shoulder strap and waist belt which is detachable, adjustable, padded for more comfortable and convenient. ADEQUATE STORAGE SPACE: The fishing tackle bag has multiple storage compartments and exterior pockets. Storage the lures, pliers, pole, fishing boxes, wallet,keys and other accessories all organized and secure. ENVIRONMENTAL & PORTABLE: Non-toxic and environmental friendly, good durability. Moderate in size. It is not too big or too heavy to carry. You can found that this fishing bag is a good choice for outdoor activities.